Transferring to another basketball program required a lot of effort until a few years ago when the NCAA relaxed the rules which resulted in a growing flood of transfers. Even after these changes, few players have an immediate impact on their new teams because they have to learn a new system and establish chemistry with players that have already been playing together for a while. Adapting and shaping a role in the lineup of the new team requires a tremendous amount of maturity. Jon Ekey, a 6’7 senior forward for Illinois, is a perfect example of how a player can insert himself into the rotation by identifying the necessary voids and making an immediate contribution. After transferring from Illinois State, Ekey is averaging 9.1 PPG and 6.3 RPG through 12 games with the Illini. The following are two specific aspects of his game that have helped the Illini during the non-conference season. 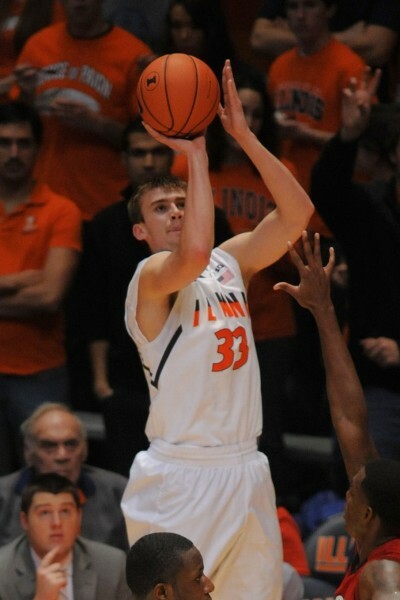 Jon Ekey has been the best long-range shooter for the Illini. Illini Nation awaits the 2012-13 season with mixed feelings. Even though most of the fans are relieved to see Bruce Weber leave after nine seasons, they are not overly excited about his replacement, John Groce. The Orange Krush and the majority of the fans expected (hoped?) Illinois to land a high-profile name such as VCU’s Shaka Smart but the coaching search was met with a couple of rejections before Groce was lured away from Ohio University. Nonetheless, everybody is eager to see how the former Ohio State assistant under Thad Matta will do in Big Ten country as a head coach. 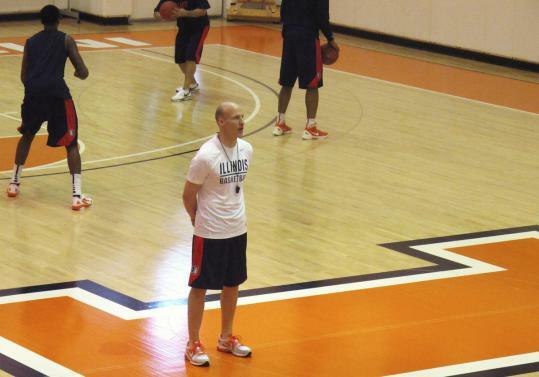 Can John Groce bring Illinois back into the top half of the Big Ten? Evaluating Last Year: Weber’s last season in Champaign can be described using one word – tiring. Even though top recruit Jereme Richmond left the program early for the NBA in spring 2011, there was still enough talent left on the Illini to finish in the top half of the conference last season. The emergence of Meyers Leonard as a formidable force in the paint (13.6 PPG) along with the return of versatile guard Brandon Paul (14.7 PPG) indicated that Illinois wouldn’t have any trouble on the offensive end. Despite their scoring talent, though, Illinois finished 11th in the conference in terms of offensive efficiency, at only 0.97 points per possession. Weber’s offense was not efficient, especially in the second half of the conference play, which led to 12 losses in the last 14 games. They shot only 29.5% from beyond the arc, but still took 35% of their total shots from deep. Weber lost complete control of the team down the stretch and the loss to Nebraska on the road by 23 points was definitely the lowest point of the season. Players looked dejected and there were numerous signs pointing towards Weber’s exit barring a surprising turnaround. Illinois ended with a 17-15 record after starting the season 15-3, which resulted in the coaching change. There’s been plenty of chatter over the last few weeks about the former Big Ten players headed for the NBA, but what about those who chose to stay behind? The biggest of those names is probably Cody Zeller, who opted to remain at Indiana for his sophomore season. A good choice? Brent Yarina from BTN.com seems to think so. The best way to make this call is to consider his ceiling and also to consider how much worse things could get. He could get hurt, like any player, or his additional time in college could give scouts time to pick him apart. But more time in college also allows a young player to mature, for him to grow into a body more suited for the NBA and for him to raise his draft stock (yes, that’s right, stock can also go up). There’s no way he would have gone No. 1 this year. But right now, there’s a great chance he’ll go No. 1 next year. Seems like a good choice. Speaking of the NBA Draft, here’s a nice one-stop-shop from the fine folks at Big Ten Powerhouse with all the information you need about the Big Ten hoopsters — Draymond Green, Meyers Leonard, Robbie Hummel and Jared Sullinger — who are moving on to the professional ranks. All of these guys have something to prove. Green dropped further than many predicted but, as he said, it just wouldn’t be right if he didn’t have to work his tail off just a little while longer (and same goes for Hummel, who’s had to work as hard as anybody to get back to this level). Many questioned Sullinger’s health heading into the draft, and Leonard’s production at Illinois led many to doubt his potential. Only time will tell. Northwestern didn’t have anybody taken in the NBA Draft, but the Wildcats did make an important addition for their future. It landed a huge commitment from Jaren Sina, a four-star point guard from New Jersey. Sina could be the biggest recruiting coup for Bill Carmody in his time as a head coach there. A second-team All-State selection in New Jersey as a junior last season, Sina averaged 20 PPG and 8.4 APG while shooting 42.9% from three-point range. Is he the guy who can finally lead Northwestern to the NCAA Tournament? Stay tuned. But while the Wildcats have had excellent forwards over the last few years, it’s been a while since an elite point guard came their way. Michigan coach John Beilein knows a thing about recruiting coups, having brought in some top young talent (see: Tim Hardaway, Jr., Trey Burke) over the last four years with headliner Mitch McGary on the horizon for next season. Despite this recent success, Beilein says his recruiting philosophy has not changed, but he admits the scenarios are changing. “(In recruiting) you have to pick your battles,” Beilein told AnnArbor.com. “The battles we’re choosing, they may be a little larger.” Michigan has largely been most successful taking its recruiting out of state, since Michigan State and Tom Izzo has had a strong handle on the Mitten State for more than a decade (that was re-affirmed last week with the commitment of two-sport star Drake Harris). Every coach will tell you in-state recruiting is crucial, but who is to argue with the success Beilein has had at UM? Here’s a bit of unexpected news that really shouldn’t surprise anybody: Aaron Craft, already known as one of the conference’s premier tough guys, has been playing since high school with a floating bone chip in his left ankle. “If he turned the ankle wrong just a certain way, that small piece of bone would get jammed back on his tibia and it would cause excruciating pain,” Craft’s father, John, told the Columbus Dispatch. The Ohio State point guard had surgery June 18 to remove the chip, and has been in a cast and on crutches since then but is expected to soon begin rehabilitation and be “full go” in 3-4 weeks. I can’t imagine any doubt that he’ll fully heal and get back to the same level we’re used to. In fact, if he’s been reaching that level this entire time, I think it’s safe to say he’ll be even better. Georgia Tech incoming freshman Corey Heyward will likely miss the entire 2012-13 season because of a torn ACL injury that he suffered in a pickup game late last week. The six-foot guard who spent a postgraduate year at Hargraves Military Academy was expected to contribute immediately as a backup for starting point guard Mfon Udofia, but short of a miraculously quick recovery between now and the new year, Brian Gregory will have to wait on Heyward’s first minutes in a Yellow Jacket uniform. Gregory has an experienced group of starters returning next season from a 4-12 last-place ACC finisher, but it remains to be seen whether all that returning talent will equate to wins. A total of 10 schools lost lottery picks in last week’s NBA Draft, with Connecticut, Kentucky and North Carolina combining for seven, equivalent to half of the lottery selections. Jason King takes a look at how each team plans on replacing the lost talent, ultimately concluding that most of the programs that put players in this year’s lottery will just move on to its next generation of stars. A couple of programs are notable exceptions, though — Weber State’s Damian Lillard was a once-in-a-lifetime type of player for the Wildcats, while Illinois’ Meyers Leonard‘s ascent up the draft boards this year was a bit flukish and, as such, it will take John Groce some time to get his program turned around in Champaign. We noted in a piece yesterday that a number of prominent seniors were left at the draft altar last week, thanking them for four years of memories and wishing them the best of luck in pursuing their professional dreams wherever they end up. Matt Norlander took us two steps further with his article Monday dissecting the commonly held perception that recognizable and talented seniors no longer exist in college basketball. His back-of-the-envelope analysis of the number of seniors drafted in the one-and-done era shows that roughly a third of the draft is populated by the likes of Festus Ezeli, Tyler Zeller, Damian Lillard, Draymond Green, and others each year, and it is many of these folks who drive the sport forward just as much or perhaps even more so than the much considerably smaller one-and-done percentage that gets so much of the annual hype. Interesting piece — read it and see what you think. It’s a light news week, so what the hell… ESPN’s college basketball and football princess, Erin Andrews, has left the network and will move on to Fox Sports as a college football, MLB and NFL reporter. For a period in the middle part of the last decade, Andrews’ basketball broadcasts were very nearly must-see TV for males under the age of ever 50. As her personal brand grew, her hoops appearances became increasingly fewer but it appears that in her new gig at Fox she’ll no longer have access to the hardwood where she earned so much of her cred. We certainly want to wish her nothing but the best as she moves on to the network featuring none other than Joe Buck and Terry Bradshaw. If you’re not cheatin’, you’re not tryin’ — so goes the old adage about life in the SEC. Charles Barkley minces no words about his stance on the issue of paying amateurs to attend certain schools (ahem, Auburn) with this hilarious clip from a celebrity softball game where he describes a teenage Dirk Nowitzki destroying Team USA in a 1997 exhibition game. The choicest series of quotes went like this: “So I call Nike and I said, ‘find out about this kid and tell him I’ll give him anything he wants to go to Auburn. Just tell him, anything he wants, we’ll get it done.’ […] “In the SEC, dude, we make sure you’re well taken care of.” Barkley went on to say that an alleged payment of $200,000 for Cam Newton seemed like a pretty good deal, considering that he led the Tigers to a national championship in his only season on the Plains. When is the Chuckster running for governor again? The 2012 NBA Draft is scheduled for Thursday, June 28, in New York City. As we have done for the last several years, RTC’s team of writers (including Andrew Murawa, Kevin Doyle, Evan Jacoby, Matt Patton, and Danny Spewak) will provide comprehensive breakdowns of each of the 35 collegians most likely to hear his name called by David Stern in the first round on draft night. We’ll work backwards, starting with players who are projected near the end of the first round before getting into the lottery as June progresses. As an added bonus, we’ll also bring you a scouting take from NBADraft.net’s Aran Smith at the bottom of each player evaluation. Note: Click here for all published 2012 NBA Draft profiles. Height/Weight: 7’1” / 250 lbs. Overview: Meyers Leonard get virtually no time as a freshman for the Illini (8.2 MPG), but he showed intriguing physical tools that started to develop the followin summer at the U-19 Championships before a breakout sophomore year for Illinois in 2011-12. Leonard is simply massive, standing nearly 7’2” in shoes with a 7’3” wingspan and cut body that put up the second-most reps on the bench press at Chicago’s Draft Combine. He became much more productive on the floor in year two for Illinois, averaging 13.6 points, 8.2 rebounds, and 1.9 blocks while shooting 58.4% from the field – the latter three numbers good for third, first, and third in the Big Ten, respectively. He shows terrific athleticism for his size, dispelling the belief that he turn out to be a stiff. Instead, Leonard actually uses his body well – especially on defense where he was able to alter many shots with his length in addition to swatting nearly two per game. He displays good maturity and basketball IQ as witnessed by numerous great interviews, and he has much room to develop as a player. The concerns are that Leonard just doesn’t do anything smoothly on offense, struggling to score easy baskets in one-on-one situations, and he isn’t confident enough in his abilities at this stage. He shoots it well from the outside and the line (73.2%), so he should start to develop more confidence in his offensive game in due time. At this point, Leonard is a project but one with big-time upside as there are few bigs in the league with his combo of size, smarts, and athleticism. He continues to rise on draft boards. The NBA pre-draft combines are in full swing. 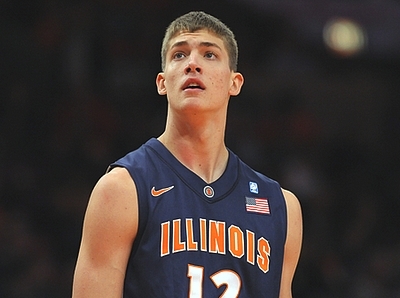 Illinois’ Meyers Leonard continues to impress the scouts and is consistently shooting up the draft boards. Despite playing a handful of minutes as a freshman, he had a great sophomore season when he averaged 13.6 PPG, 8.2 RPG, and had a few jaw-dropping blocks to amount to 1.9 rejections per game. Leonard may not have the true post moves to become a dominant scorer at the next level but his physical attributes (7’1″, 250 lbs.) and work ethic are good enough to work as a defensive presence in the NBA. Leonard tries to model his game after defensive studs such as Joakim Noah and Tyson Chandler, which is a very reasonable comparison for somebody whose offensive game continues to evolve. More on the NBA Draft, Ohio State’s Jared Sullinger seems to be a consensus lottery pick, but may not be picked in the top five this year. A year ago, he was projected that high after his freshman season but he came back instead to lead the Buckeyes to the Final Four. Sullinger’s scoring remained the same between both seasons (17.5 PPG as freshman to 17.2 PPG as a sophomore) but he was able to improve his rebounding to 10.2 per game and show range in his jump shot after returning to Ohio State. Despite the drop on the draft boards, Sullinger has no regrets about coming back to Columbus. It is still unclear whether Sullinger is a true power forward in the NBA, but adding range to his game along with his tremendous intensity on the court should indicate to several NBA teams that he will improve over the years. Wisconsin fans can’t wait to see incoming freshman Sam Dekker in action. The 6’8″ forward is the reigning Mr. Basketball in Wisconsin and has been named to the USA Men’s Basketball under-18 roster. Most freshmen that begin their careers in Madison don’t come in with several accolades but Dekker is certainly an exception. If Ben Brust and Josh Gasser can try to take over point guard duties in the absence of Jordan Taylor, Dekker combined with Ryan Evans should form a formidable frontcourt next season for Bo Ryan. Both Big Ten coaches who were let go after last season have a new home in the Big 12. Bruce Weber took the job at Kansas State but he has company from former Nebraska coach Doc Sadler now at Kansas. Sadler is the new Director of Basketball Operations in Lawrence and replaces Barry Hinson who took the head coaching job at Southern Illinois University this offseason. Sadler was 101-89 at Nebraska but the newest addition to the B1G decided to take a new direction by letting him go last season. Sadler coached in the Big 12 for a few seasons and his experience ought to help Bill Self continue Kansas’ unparalleled dominance in the conference. Speaking of Bruce Weber, he would have needed a few big men on his roster if he would have stayed at Illinois. Current Illinois coach John Groce considers size a high priority as well and he recently received a verbal commitment from Maverick Morgan, a prep center from Ohio. Morgan is a 6’10” center who is ranked #148 by Rivals as he enters his senior season this fall. Groce’s offense at Ohio has revolved around guards such as D.J. Cooper but Morgan along with current sophomore Mike Shaw will have to play a key role in rebounding, especially during the Big Ten campaign. What Can We Learn From NBA Draft Combine Measurements? The top 60 prospects for the upcoming NBA Draft were invited to Chicago for the official NBA Draft Combine late last week, where players seek to impress the loads of pro scouts and executives in attendance in preparation for June 28. Before players even began competing in drills and scrimmages, they were first tested by the ‘tape’ in an extensive set of measurements. This year’s numbers were released on Friday, which include everything from height and weight to hand width and horizontal wingspan. But do these physical measurements really mean anything? Does the fact that Michael Kidd-Gilchrist measured a half-inch shorter than expected, or Jae Crowder’s hands are some of the widest of the group, have an impact on that player’s chances to succeed in the league? Adjusting to the elite size and speed of NBA competition is important for all incoming prospects, but a ball player is a ball player, regardless of his standing reach or hand size. History shows that some Combine measurements become useful in predicting future success while others bear no weight at all, making it a difficult data set to analyze. This year’s athletic testing results (bench press, agility drill, vertical jump, etc.) are not yet released, so we’ll just take a look at the player measurements and what they mean. Some notable numbers from this year include Meyers Leonard’s massive height without shoes (6’11.75”), Andre Drummond’s ridiculous wingspan (7’6.25”), John Henson’s skyscraping standing reach (9’3.5”), Kevin Jones’ excessive body fat (11.2%), and Andrew Nicholson’s enormous hands (10” long, 10.75” wide). But didn’t we already know these things? We knew that Drummond was a freakish physical specimen, and Henson’s intrigue as a prospect stems from his elite length. We know Leonard is huge and Jones doesn’t look like much of an athlete. 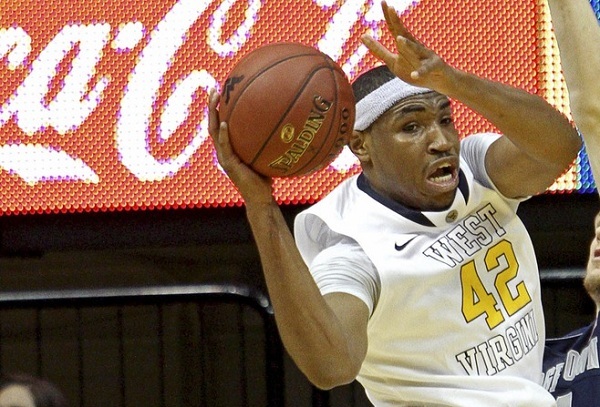 But that becomes the dilemma – should scouts put more stock in Kevin Jones’ physical measurements, or his versatile skill set that’s been on display at West Virginia for four years? The hard part is determining to what extent, if any, a player’s body will impact his ability to contribute in the NBA. The Indiana–Kentucky series just isn’t happening. The negotiations had begun again a few weeks ago but the latest proposal was rejected again. According to reports, Kentucky rejected the four-year extension proposed by Indiana which includes a game at Kentucky and Indiana. The positive sign is that the schools appear to be continuing to try to keep this traditional rivalry alive for the sake of college basketball and the fans of the respective schools. Illinois‘ decision to hire John Groce was met with a fair amount of friction by some alumni because they had their doubts about his ability to recruit in Chicago. Groce continues to search for a top assistant who would focus on player development but also help him lead the effort to establish recruiting connections in Chi-town. Isaac Chew was brought in as an assistant due to his ties to Chicago but he left Champaign after a short stint to work with Buzz Williams at Marquette. Illini fans can’t be discouraged with this news because Groce understands that the rebuilding effort will need a great coaching staff and is willing to take his time to put it together. Ohio State‘s Jared Sullinger is considered one of the top ten players in the upcoming NBA Draft. Most of the mock drafts have Sullinger slated to go in the later part of the Lottery. Sullinger may not have a clear position in the NBA but his leadership during his sophomore year to lead the Buckeyes to the Final Four will certainly help his case as the pre-draft workouts will pick up pace over the next few weeks. While Jared Sullinger may be a consensus pick in the Lottery, Illinois‘ Meyers Leonard will need to prove his value during the workouts a little bit more. Leonard hopes to be a first round pick in a draft that features several big men such as Thomas Robinson of Kansas and North Carolina‘s Tyler Zeller. Leonard could have used another season at Illinois to polish his post moves but his physical abilities and work ethic ought to help him get to the next level. Tom Izzo and politics? Why not? Izzo could not have become a great college coach without his abilities to sell the Michigan State program and his brand of basketball. Now, he is trying to translate his leadership experience in public policy as he is one of the key speakers at the Mackinac Policy Conference in Michigan. Perhaps listening to a coach with multiple Final Fours and a National Championship can help build teams outside of the basketball court. It has been a long season for the Fighting Illini basketball fans around the Midwest. Most realistic fans knew that they would have a tough time with a younger team but few expected the talent to come out firing during the non-conference season. Wins against Gonzaga and Maryland showed that Bruce Weber’s team had the talent to compete in the Big Ten and beyond. But it was a red herring for the most part because Weber could not control the team and did not necessarily use the player’s skill-sets in an efficient fashion. Illinois lost ten out of 12 games to finish the season at 17-15 and were not even invited to the NIT. Most other Big Ten teams such as Iowa and Purdue improve towards later part of conference season but it was very obvious that Weber’s time was done in Champaign after road losses to lower tier programs such as Nebraska. The fans couldn’t fathom missing the NCAA Tournament for the third time in five years and Bruce Weber was let go. It is a new era in Champaign with John Groce taking charge but let’s look back at what can only be classified as a trying season for Illinois basketball. Meyers Leonard and the Illini fell significantly short of expectations. The changes at Illinois keep coming. The Fighting Illini will have a new coach in John Groce roaming the sidelines next season, but won’t have the same big man roaming the paint. Sophomore center Meyers Leonard announced Tuesday he is declaring for the NBA Draft and will leave college early. “This was a very difficult decision because I love the University of Illinois,” Leonard said in a statement. “But I feel the timing is right for me to follow my dream of playing in the NBA and having the opportunity to provide for my mom and family.” It shouldn’t really come as a huge shock. He averaged 13.6 PPG, 8.2 RPG and 1.9 BPG this year. Minnesota’s season ended on an ugly note, but that should not take away from the optimism some fans were generating the last few weeks. FOXSports.com‘s Tyler Mason writes that Andre Hollins and Rodney Williams gave fans something to cheer about during the NIT run and that should be the case again next year. Back to Illinois, we can talk about some personnel coming into the program instead of leaving it. John Groce is starting to round out his staff and has tapped former Ohio assistant Jamall Walker, a source confirmed to the Chicago Tribune on Monday. Walker is the first addition to Groce’s staff in Champaign; he played at St. Louis, and has a strong reputation for working with point guards and could be the guy to help Groce tap into Chicago recruiting. The clock is ticking for college players to make their decision about whether to stay in school or opt for the NBA Draft — they must declare that they are looking into the NBA by April 3 and must declare or withdraw by April 10, according to NCAA rules — but the Indianapolis Star‘s Bob Kravitz says this situation puts too much pressure on the players. Kravitz is talking about players like Christian Watford, who only have a small window of time to make a critical decision and give NBA evaluators just a small sample size. Is that fair? Things are looking up with the Iowa basketball program, but the program’s history got a little bit of a boost this weekend in New Orleans. Former Iowa player and coaching great Don Nelson was elected into the Naismith Memorial Basketball Hall of Fame on Monday morning. According to the Gazette, Nelson led Iowa in scoring and rebounding all three seasons he was eligible to play and ranks 11th all-time in scoring with 1,522 points. He is also now the NBA’s all-time winningest coach with 1,335 wins.